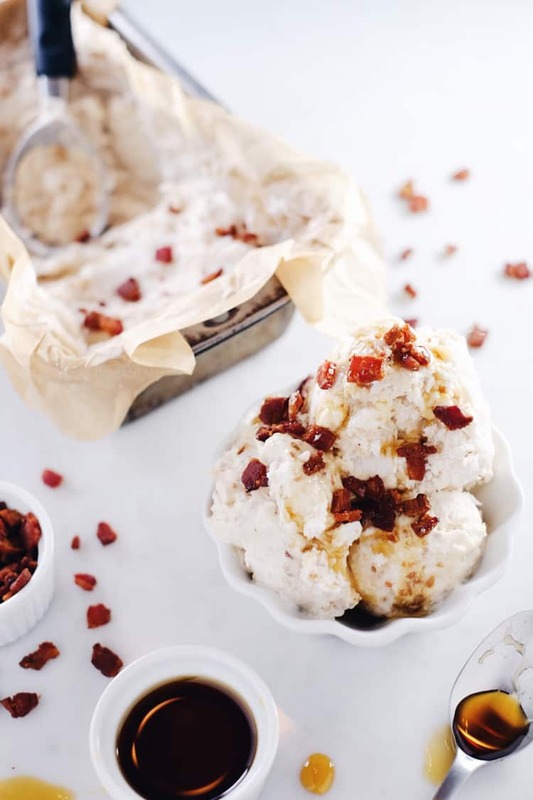 Have you ever thought that ice cream and bacon might be good together? 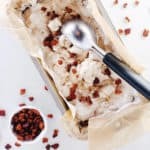 Well, I did but I couldn’t find a recipe I was wild about, so I created this bacon topped date ice cream. The ice cream itself is sweetened with date paste which adds texture and flavor to the vanilla ice cream. The crumbles of bacon on top with a little drizzle of maple syrup makes this dessert unreal. It’s like breakfast and dessert at all once! Plus, this one is a no-churn recipe. Date paste is a great natural sweetener that can be used in ice cream, like we are doing here, or also in baking. It is really quite easy to make, too! There are two ways you can do it. Either way, you will want to first start by soaking your dates in warm water to soften them. The first method for making date paste, and the easiest, is in a food processor. Drain your softened dates and place them in your food processor with a couple of tablespoons of water. Pulse, starting and stopping a few times, until the dates break down into a paste. Depending on the size of your food processor, and if it is larger, you may have to stop and scrape down the sides a couple of times. The second method is by hand with a fork. Drain your softened dates, and add a couple of tablespoons of water to the bowl. Use a fork to mash up the dates. This method works just fine, however, it takes a little longer. Depending on how softened the dates are it is more or less work to get them to break down. In my opinion, the benefit of this method is less dishes to clean. Either way works though, so do what works best for you! Well, this is a personal preference I believe. I like to add one or the other to our ice cream because it adds protein and is also good for gut health, in addition to your skin, hair and nail health. So, why not add some in, right?! It is flavorless, and you would never even know. I think the main advantage to using gelatin is that it will help your ice cream to set faster in the freezer, and it will also give your ice cream a little bit more of a smooth and creamy texture. I prefer to use collagen though because for whatever reason I seem to digest it better, which I have read is the case for some people. So give it a try, and add collagen or gelatin to your ice cream! It’s a fun way to start incorporating this superfood into your diet. For other recipes that use collagen, check out our pumpkin chai latte, berry protein smoothie bowl, banana almond butter smoothie and no churn pistachio ice cream for a few ideas. 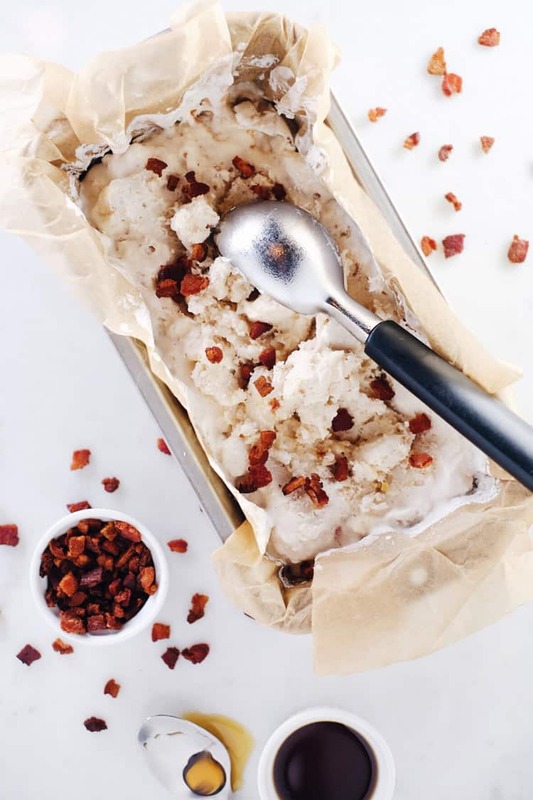 Ok, go ahead and make a batch of this bacon topped date ice cream and enjoy the salty-sweet flavor combination. Let us know how it goes by leaving a comment below. Then, take a photo, and tag us on Instagram @realsimplegood, so we can check it out! Start by soaking your dates in warm water. Line a freezer safe container, like a bread pan, with parchment paper. Make your ice cream base by combining your coconut milk, vanilla, collagen and salt in a medium mixing bowl. Use a whisk to combine the ingredients. Pour into parchment lined pan. Place your soaked dates in a small mixing bowl. Add water and use a fork to mash up the dates, turning them into a paste. You can also do this in a food processor. Once the dates are broken down, add them to the ice cream base, spreading it around in the pan. Place in the freezer, and chill for three to four hours. If you use gelatin it will take less time to set. While the ice cream is setting, make your bacon. Heat a medium skillet over medium heat, and place your bacon bits in the pan. Stir occasionally, and cook until crispy, about 6-8 minutes. Once done, remove from heat and place on a paper towel lined plate. If you've chilled your ice cream for more than a few hours, remove from the freezer about 15-20 minutes before you serve. 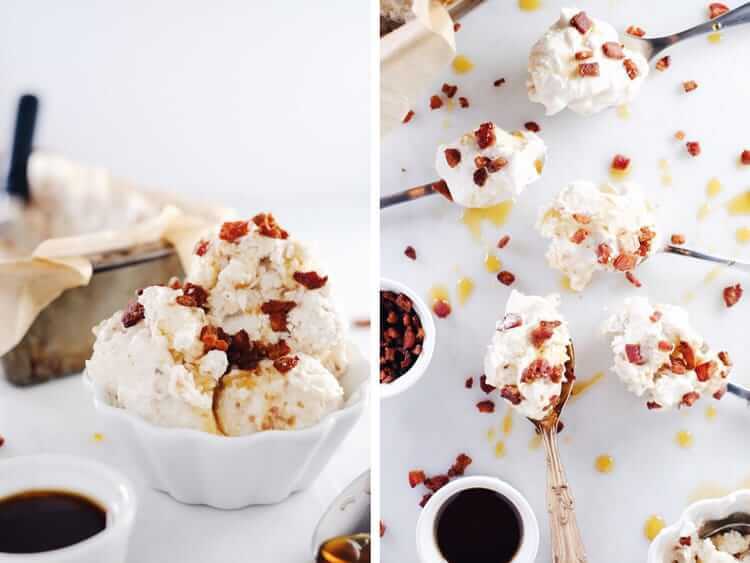 To serve, scoop ice cream into small bowls or ramekins, and sprinkle with bacon bits and drizzle a bit of maple syrup. This will last in the freezer for about a week in an airtight container, but tastes best when served within a few hours of making or within a couple days. Maybe I missed it, but how much maple syrup do you use in the ice cream base?